This is web page http://www.roperld.com/RoperHoxne.htm. A Roper family lived in Hoxne, Suffolk, England from about 1500 to 1750 and possibly earlier. One branch moved to Tibenham, Norfolk (13.5 miles away) about 1550. One branch emigrated to Virginia 1615-1650. It is not know whether it left from Hoxne or some other later location. One branch moved to New Buckenham, Norfolk (13.5 miles away) before 1635. This branch emigrated to Massachusetts in 1637. One branch moved to Bressingham, Norfolk (7.5 miles away) about 1750 (Other villages: Winfarthing, Shelfanger). One branch moved to Eye, Suffolk (4 miles away) about 1790. One branch moved to Thornham Magna, Suffolk (8 miles away) before 1800. The above statements are known to be true by means of extensive genealogy work done by Peter James Roper of Great Yarmouth and L. David Roper of Virginia and by Y-chromosome testing of many English and United States Roper males. The first 11 generations of known descendants of the earliest-known Hoxne Roper b c1475. Different colors are used for the Suffolk and Norfolk places (Hoxne, Tibenham, New Buckenham, Bressingham, Eye and Thornham Magna). No information is known about the connection of the Virginia branch to the other branches. Red squares mark the eight known Roper graves. The front graves are near to the main door of the church and date to the early 1700s. 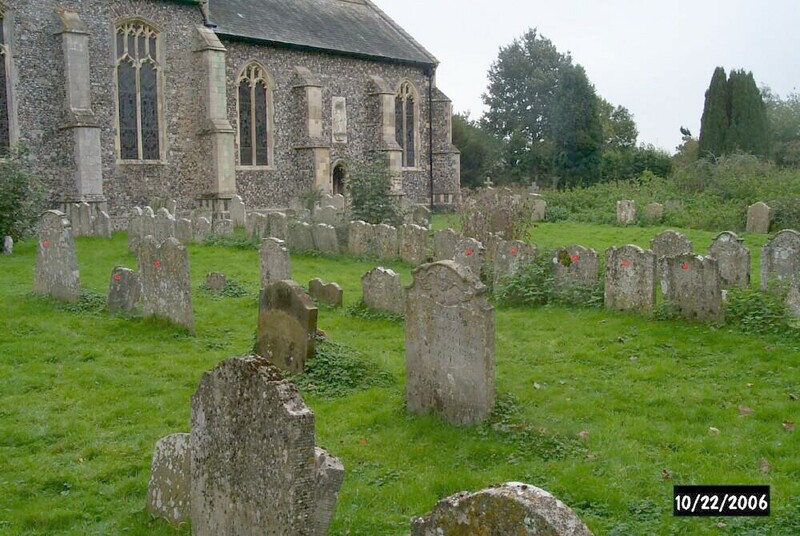 Since the data show that this Roper family was in Hoxne from the 1500s or earlier, I suspect that those graves are on top of the graves of earlier Roper ancestors. A Samuel Roper (b c1742 d 1802) is buried under the floor near the altar of the church with his wife’s family (Leman). In the Roper male-lines Y-chromosome project, this Hoxne Roper family is known as the RoperY1 or RY1 family. The ones not labeled “England” or “Massachusetts” have been assumed to be from colonial Virginia Ropers in the past. AGGR (England) is the one whose mutations of the 67 markers relative to the common ancestor of all twelve of the family members are most different than all the others. It is possible that he is not even "related" to the other eleven, i.e., not in the RY1 family. Only the England Ropers, Massachusetts Ropers, RSR & LDR are listed here. 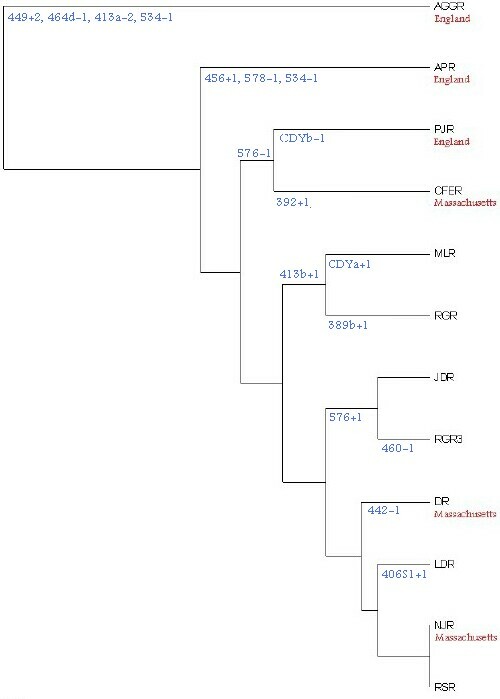 Note that the CFER (MA) branch appears to not have mutated much since leaving England, whereas the DR & NJR (MA) branch has mutated more. It appears that the LDR (me) and RSR branches might have migrated south (to VA/NC & VA/KY, respectively) from MA, instead of coming to colonial Virginia directly from England c1600s. Good genealogical data for the Massachusetts branch show that CFER & DR are 6th cousins with common ancestor Ephraim Roper III (b 1716 MA) and that CFER & NJR are 7th cousins with common ancestor Ephraim Roper Jr (b c1687 MA), father of Ephraim Roper III. So, the extra mutation for DR & NJR must have occurred in a generation after Ephraim Roper Jr. Since LDR (me) and RSR are genetically close to DR and NJR, it is likely that the ancestry of LDR and of RSR are in the branch of descendants of Ephraim Roper III.